The rules are referred to as SSS (Sitting, Sleeping, and Standing) and they need to be followed exactly during treatment and beyond so that improvement is not hindered. These three rules will be explained to you and demonstrated at your first visit so that you will leave feeling confident when following the recommendations. During treatment, following these three rules is the only thing that you need to do to make sure that you are keeping the stress on your body to a minimum and are improving as expected. Many people are stuck in bad habits when it comes to the way they sit, sleep and stand and sometimes it can be difficult to break these habits; it is, therefore, important to address these barriers to recovery. Slumping at our desks or into our sofas and car seats due to their poor design can result in forward stress to the spine. This will lead to vertebrae being pushed forward, increasing pressure on the front aspect of the spinal structures and predisposing the structures towards the back to injury. Over time, this will also result in a hyperkyphosis. It is therefore recommended that you address your sitting habits so that your spine is under as little stress as possible during the day. The recommended sitting position is in a firm chair with your knees below the hips on a gentle slope. Sitting on a seat wedge with your feet flat on the floor is ideal as this creates a gentle slope from the knees to hips and allows the pelvis to sit in its optimal position. The first image depicts a common slouched posture while sitting. The second image depicts a better sitting position but the body is still under undue stress. The third image demonstrates the positive change in posture that occurs when a seat wedge is used. The fourth image demonstrates the best way to sit without a seat wedge to hand. It is incredibly difficult to achieve this posture while sitting on your sofa. Modern sofas are very poorly constructed resulting in them being too soft, too deep and too low. The only way to address this is to sit with a thick firm cushion(s) underneath your backside and behind you to lift you up out of a slumping position. You will need to sit with your feet flat on the floor with your legs parallel to the front vertical aspect of the sofa. Sitting at a desk or workstation can also cause problems. The images below demonstrate the common problems associated with poorly set-up office equipment. The first image demonstrates a workstation that has been set-up incorrectly. The chair is badly designed and the computer screen is far too low. The person is also sitting cross-legged and is not close enough to the desk. The second image demonstrates the optimal set-up for your workstation. A well-designed chair with a seat wedge, the computer screen has been raised up to normal eye level and the person is sitting with feet flat on the floor and as close to the desk as possible. Workstation set-up: Left – Incorrect, Right – Correct. 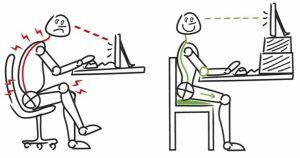 Here is a short video that explains a number of other hidden risks of sitting. On average we sleep for 6-8 hours per night. If you are sleeping on a poorly designed mattress, it’s too soft or too old then this can result in spinal stress while you sleep. You may even be sleeping twisted during the night or using a pillow that is too high or too low. As such, many people complain of feeling stiff and experiencing pain when waking and rising in the morning. Even if you do not experience problems when waking, you may still be sleeping with undue spinal stress as many people are not aware of the correct way to lay in bed. The recommended sleeping position is either on your back or side with enough support under your head. The correct head support is paramount in reducing adverse spinal stress while you sleep. The best way to get the correct head support is by using either a pillow with adjustable foam layers or a simple set of towels. Towels can be folded so this allows you to fold back the layers and check the level for the correct height. Once you find the correct height of towels or foam pillow then your facial muscles will relax and your eyes will close naturally. Tossing and turning during the night is a very good indicator that your spine is not happy and is under stress while you are asleep. The images below demonstrate the correct way to set up your head support. When laying on your side your body should be stable in the midline and not want to roll backwards or forwards. The images below demonstrate the incorrect way to set up your head support. As you can see, while laying on your side if there is too much head support your body wants to roll backward and with too little, it wants to roll forwards. When laying on your back with too much head support you can see that the head is lifted up too far. A recent study by Hedok et al (2015) suggests that sleeping in the lateral position (on your side) has an advantage with regard to the removal of waste products because clinical studies have shown that sleep drives waste clearance from the brain. Therefore, side lying with the correct head support not only balances spinal stress during sleep but it also improves waste removal from the brain. There are many different types of footwear that exist today and our parents can have us wear shoes from a very early age as we first start to walk. From this point onward we are exposed to footwear and the dangers of poorly designed shoes or trainers. Man was designed to walk barefoot, so the type of footwear that we need is flat and unsupported and as close to barefoot as possible. It is therefore recommended that flat shoes be worn with no built-in support, i.e. arch supports. An ABC chiropractor may use special shoe inserts or heel lifts to help support the body if indicated. During the unwinding process, which is explained on the unwinding page, it is especially important to follow the sitting, sleeping and standing rules otherwise the unwind can be more uncomfortable than it needs to be. You will also stunt progress and interfere with the treatment outcome and prognosis. If people are not progressing as they should then this is usually due to an SSS problem.